With that in mind, when I got offered a Turtles Half-Shell Heroes Mutant Loader Vehicle to review I could hardly say no could I! In fact, just like the Imaginext Arkham Asylum, he bugged me everyday waiting for the postman! So what does the loader vehicle do? In simple terms....it's for catching the baddies! They can be scooped up on to the forklift and with a turn of the wheel, they are lifted and flipped into the capture cage. Well....Elliot loved this! He immediately went and got his other TMNT figures and each and every one got scooped up into the cage, good guys or bad guys...he wasn't picky! The vehicle comes with a Mikey figure who is coming out of his shell for the first time ever...is this possible?! Where did he leave his shell?! Also, in my day he was called Michelangelo - how long has he been known as Mikey!? 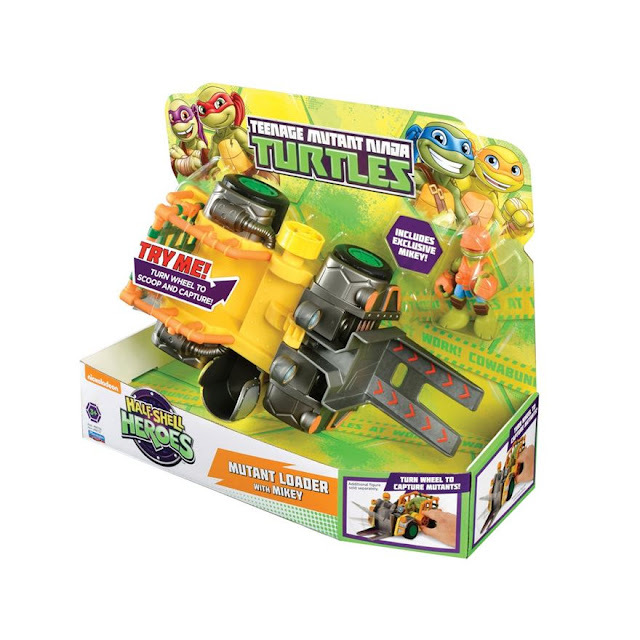 What I loved about this toy is that it's really chunky and well made, perfect for younger TMNT fans.(2+). Some toys can be quite flimsy but Mikey and his vehicle have already been bashed around and fallen from a great height several times with no breakages. Newborn Essentials - Things We Actually Used!